March 20, 2018: The closing minutes of winter 2018 marked a joint effort by the Group Insurance Commission and Mass Retirees to pass emergency legislation to merge the GIC’s two insurance pools. March 16, 2018: Prompted by Mass Retirees’ calls for reform of the Group Insurance Commission’s Retired Municipal Teacher (RMT) Program, legislation has been filed today by Governor Baker that places RMT enrollees in the same insurance pool (Pool 1) as other state and local retirees. Association officials are now calling upon Legislative Leadership to act quickly on this before the GIC’s Open Enrollment begins on April 4. 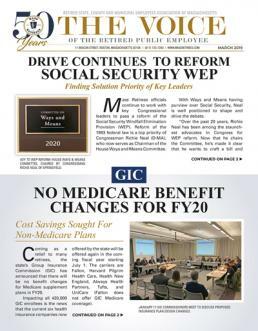 FEBRUARY 27, 2018: Key representatives from states impacted by the Social Security Windfall Elimination Provision (WEP) met in Washington, DC this week, as pressure to pass reform legislation continues to mount. Mass Retirees joined key WEP reform ally, the 88,000 member-strong Texas Retired Teachers Association, for the annual meeting of the Coalition to Preserve Retirement Security. CPRS is a national organization of public retirement system and advocacy group officials from non-Social Security states. February 22, 2018: Today, the state’s Group Insurance Commission (GIC) approved health plan premiums for FY19. For the first time in recent memory, the average increase across all six GIC health plans is zero percent. Beginning in June, the majority of retirees enrolled in GIC health plans will see a slight decrease in their monthly insurance premiums. For both retirees and active employees, the inflationary and premium rates vary by health plan. FEBRUARY 21, 2018: The state’s Group Insurance Commission (GIC) is scheduled to meet this Thursday to set health, life and dental insurance premiums for FY19, which begins on July 1. On average premium insurances are anticipated to increase less than 2% across the six health insurance providers offered by the GIC. Those providers are Fallon, Harvard Pilgrim, Health New England, Neighborhood Health Plan, Tufts and UniCare. Association members received good news this month when the Joint Committee on Public Service favorably released five key bills filed by Mass Retirees. The bills apply to the veterans bonus, basic life insurance, Option C recalculation, post retirement earnings, and the right of surviving spouses to retain health insurance benefits upon remarriage. State Retirees and active employees should be aware that an election is now underway for one of two seats on the State Board of Retirement. These elected officials are your representatives on the five-member Board. As members know, Mass Retirees President Frank Valeri currently serves as one of the two elected members on the State Retirement Board. His term will end December 2019. Our office has been inundated with calls from anxious members seeking information on the fate of the Mass Retirees backed federal proposal to reform the Social Security Windfall Elimination Provision (WEP). With a growing majority of members victimized by the WEP and losing thousands of dollars a year in Social Security benefits, it is no wonder that interest remains high. Mass Retirees and teacher union officials are urging the GIC to seek ways to expand the health insurance offerings available to the 10,000 teachers participating in the Retired Municipal Teacher (RMT) program. As the only respondent to the GIC’s procurement process last fall, UniCare is set to become the sole health insurance provider for RMTs in FY19. The state’s Group Insurance Commission has set April 4 through May 2, 2018 as the annual Open Enrollment period to enrollees to change insurance plans or enroll in the GIC’s Retiree Dental Plan. Any changes in plan selection or coverage take effect on July 1, 2018.